These carrot cake overnight oats are your new busy morning savour! With only 7 ingredients in under 5 minutes you can magic up a fun and nutritious breakfast that is perfect whether you are on the go or just at home. Vegan, GF & healthy. The day before serving add the oats, grated carrot, honey/maple syrup, raisins, cinnamon, chia seeds and milk into Tupperware container or jar and give everything a good mix/shake. Refrigerate overnight. In the morning remove the oats from the fridge, give them a stir before topping with the walnuts, yoghurt and a little more honey/maple syrup if desired. Serve. 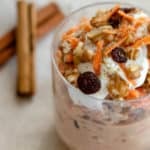 I personally prefer these carrot cake overnight oats cold but on super chilly mornings you can also serve them warm. Just remove the container lid and pop into the microwave for 3 minutes before topping with the walnuts and yoghurt. These overnight oats are best served the next day but keep well in the fridge for up to 3 days. Why not double / triple this recipe to keep you going for multiple mornings?! Gluten Free: Make sure that your oats are certified gluten free. Vegan: Use maple syrup rather than honey and a plant based milk and yoghurt. If you aren't a fan of raisins, you could also use chopped up dates, dried apricots, dried cranberries or leave them out all together! Remember to always check that your dried fruit doesn't have any added sugar or preservatives. The chia seeds help the mixture to congeal whilst adding fibre but are by no means necessary. I personally like to use oat milk in this recipe for the creaminess it brings. You can use any milk you prefer. If using plant based milk remember to check the label for added sugar, E numbers or preservatives.